Flying first class is something amazing for a luxury travel passionate, especially aboard a world renowned airline company. 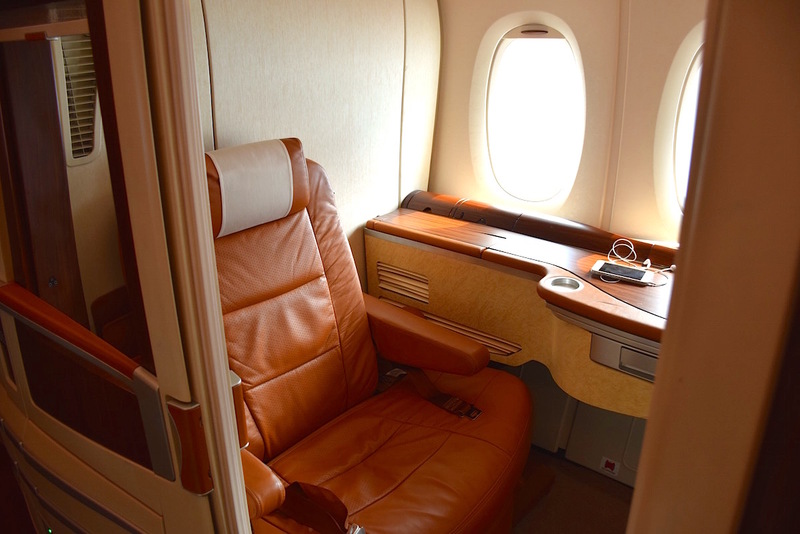 And when you deal with the legendary Singapore Airlines A380 Suites class, your simple journey turns into a dream experience. Wondering what is the best option to use your Star Alliance miles? For us, it’s easy. Just wait for your next flight to Singapore and reward yourself with an upgrade to the award-winning Singapore Airlines A380 Suites class. VIP check-in, ground services, in-flight catering, seat configuration… Everything is perfect and offers a complete luxury journey to passengers with a brilliant cabin crew service ; so far, this is my best first class experience ever. 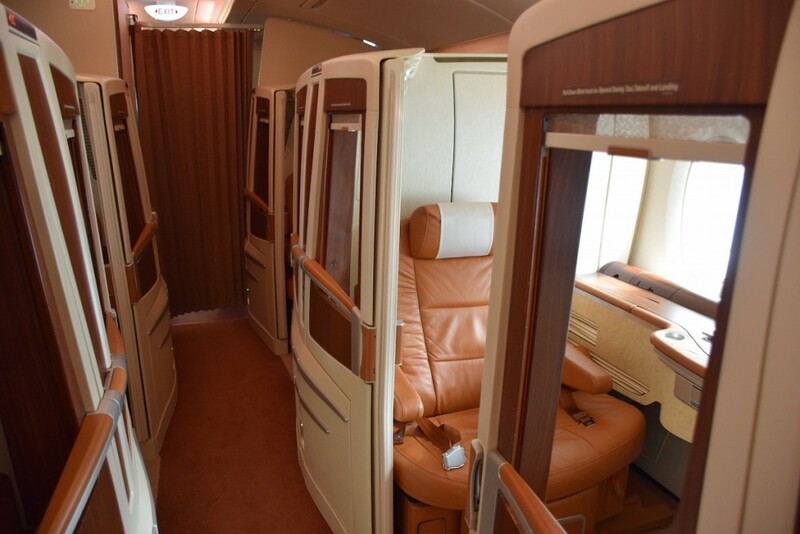 The Singapore Airlines A380 Suites class has a 1-2-1 configuration with 12 seats – only 3 of them were occupied during our flight – located at lower floor of the aircraft, providing 100% privacy to passengers thanks to 1.50-meter walls ; forget the “mini-suites” you can find in other companies, here we have true suites. The leather seat itself is very large and comfortable, like the Business class one, with a large 58-cm screen and a very convenient sliding table for lunch/dinner. Materials and design are really unique in the industry, giving the sensation to fly aboard a private jet. However I would expect to have a touchpad instead of the regular Economy class remote control to pilot the Krisworld entertainment system, as well as a toiletry bag even if it was a day flight ; anyway, these are small details. I didn’t book anything in advance via the Book the Cook complimentary service because I wanted to give a chance to the onboard menu. I was right! From appetizer to dessert, the a-la-carte selection were stunning with good products and faultless plate service. 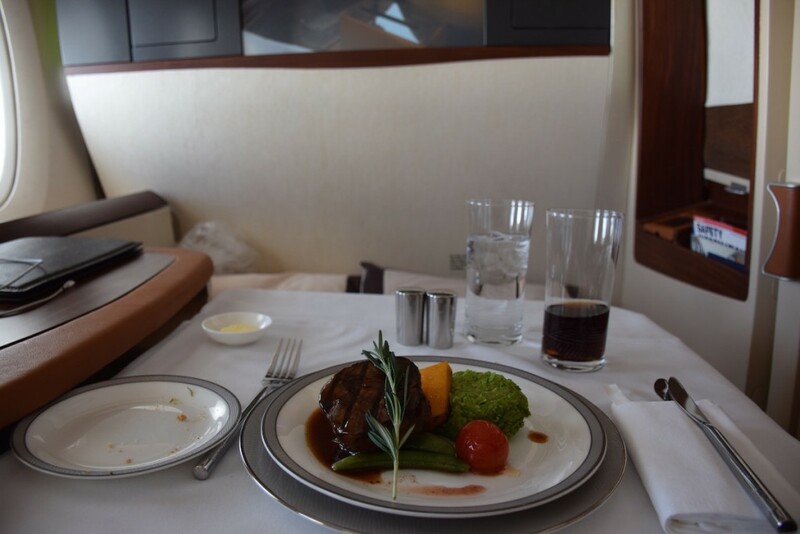 I especially liked the duck foie gras and the grilled beef fillet ; can you imagine to enjoy such dishes during a flight?! Cabin crew were very attentive to the 3 Suites guests we were, being proactive and giving their best to satisfy our needs ; this is what you can expect from a five-star airline company. SIN to PVG, day flight on A380 in September 2015.